The Koke cooperative was established in 1975, and joined The Yirgacheffe Coffee Farmers Cooperative Union (YCFCU) in 2002. It currently has 1,153 member farmers. 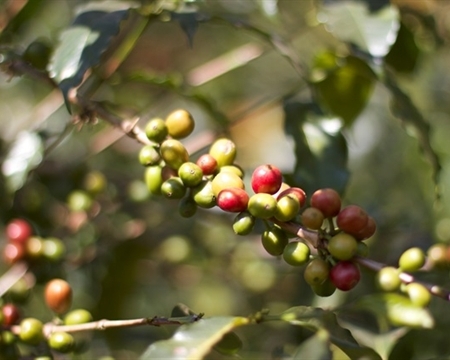 All of the members grow their coffee on plots of land under 4 hectares. By joining the YCFCU, the KOKE cooperative has benefited from being a part of a larger cooperative and a network of coffee producers. YCFCU has built schools, helped bring electricity to small villages and communities, and built bridges to make transportation safer and easier. A very exotic and tasty Ethiopian Yirgacheffe. Good body with some very complex darker spice tones. A little lower acidity than the usual Ethiopian and milder on some of the red fruit notes. Lighter roasts will have a little hint of acidity, nice chocolaty factor with some black tea like spice notes, as the cup cools one can see some red fruit in the cup but while piping hot, are overtaken by the classic Yirg spice tones. Medium roasts up to 2nd crack build the chocolaty factor nicely while muting up the acidity. Soft fruit tones comes through in the aftertaste. A cool cup from light to dark but erroring closer to 2nd crack than first was a good thing in our book. This cup is not all about ferment fruit, this cup is about complex tea like and floral spice which find a balance around a strong medium roast. Nice and clean for a natural, easy to roast.